Gadacz, René R.. "Kayak". The Canadian Encyclopedia, 31 July 2018, Historica Canada. 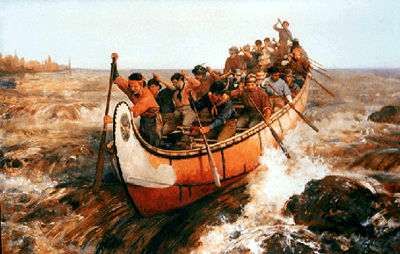 https://www.thecanadianencyclopedia.ca/en/article/kayak. Accessed 20 April 2019. For over 2,000 years, the Inuit have used kayaks for traveling and hunting expeditions, except for the most northerly polar Inuit. 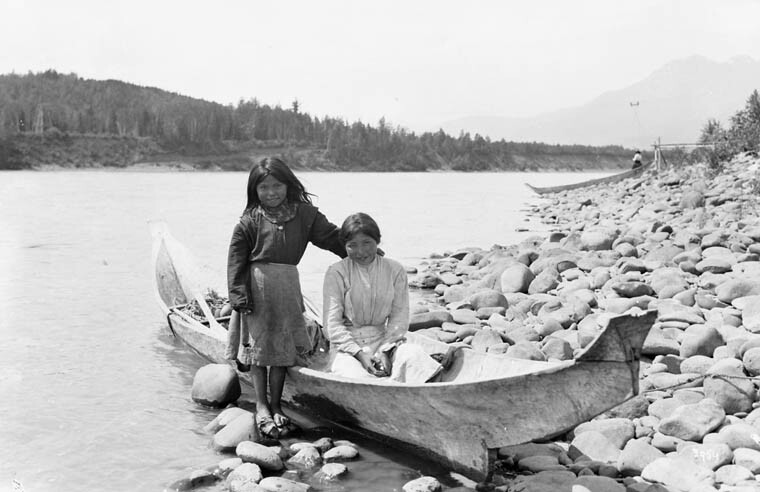 Circa 1901, NWT (Charles W. Mathers/Library and Archives Canada/C-005106). For over 2,000 years, the Inuit have used kayaks for traveling and hunting expeditions, except for the most northerly polar Inuit. Essentially a one-person, closed-deck hunting craft, it was employed occasionally for the transport of goods. Although kayaks are rarely used today for hunting, the kayak remains an important part of Inuit culture and heritage. 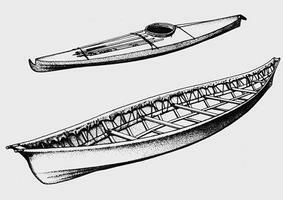 Fast and seaworthy and ranging from four to seven metres in length, the kayak was built to hold one-to-three persons. Covered with de-haired seal or caribou skins, the frame was often made of driftwood, with ribs of willow branches. Both single and double-bladed wooden paddles were used by kayakers to propel the craft. To make the entire craft watertight, even when tipped, the kayaker wore a parka that was tied around the hatch-hole rim. Unlike the umiak — a traditional Inuit watercraft that was open — the kayak had a covered deck, which improved its manoeuvrability in waters. 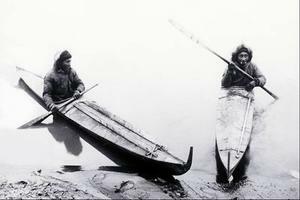 However, the kayak did not replace the umiak; both were used for travelling and for transportation during the hunting season. According to Inuit oral tradition, kayaking was a way of life as well as a practical tool used for hunting and travelling for over 2,000 years. An individual’s mastery of the kayak measured personal growth and connection to the community. The kayak also provided the Inuit with a means of interacting with Arctic geography and ecology; kayaking was a way to explore landscapes, access natural resources, encounter animals and socialize with the Inuit of other communities. Within the last century, plastic and glass-fibre materials have replaced traditional construction materials, such as wood and canvas, in order to improve the craft’s sea-worthiness. Few Arctic communities still use kayaks for hunting, as modern boats prove more efficient. However, kayaking remains an important part of Inuit culture and tradition. E. Arima, Inuit Kayaks in Canada: A Review of Historical Records and Construction, Mercury Series (11) (National Museums of Canada, 1987); H. Golden, Kayaks of Greenland: The History and Development of the Greenlandic Hunting Kayaks, 1600–2000 (White House Grocer Press, 2006); J. Heath & E. Arima, Eastern Arctic Kayaks: History Design and Technique (University of Alaska, 2004); H.C. Petersen, Skinboats of Greenland (Attuakkiorfik, 1986).